Maine Votes On Expanding Access To Medicaid : Shots - Health News The state of Maine has wrestled for years over whether expanding its low-income health insurance program would help more people or be a budget buster. Now they're going to take it to a vote. Kathleen Phelps, who lacks health insurance, speaks in favor of expanding Medicaid at a news conference in Portland, Maine on Oct. 13, 2016. Maine is one of 19 states that rejected Medicaid expansion through the Affordable Care Act. But on Tuesday, it could be the first to approve it at the ballot box. Question 2 asks Maine voters if they want to provide roughly 70,000 Mainers with health care coverage by expanding eligibility of Medicaid, known as MaineCare. It provides health coverage for people living at or near the poverty line. The national battle over Medicaid expansion began with a 2012 U.S. Supreme Court decision that conservatives originally hoped would hobble the Affordable Care Act, President Obama's signature legislative achievement. But instead of repealing the law's individual mandate requiring that most Americans obtain health insurance, the court upheld it. The court then struck down a provision requiring all states to expand eligibility of Medicaid. That surprise 2012 court ruling shifted the political battle. While the GOP-led House of Representatives would go on to take over 50 symbolic ACA repeal votes, progressive and conservative activists descended on state legislatures to fight over Medicaid expansion. The intensity of those battles illustrated the importance of Medicaid expansion as a component of the ACA. The program not only lowered the number of people without health insurance, it also has arguably made repealing the health care law harder. Medicaid funding cuts included in Senate bills to repeal ACA were the primary reason that Sen. Susan Collins, R-Maine, broke ranks with most of the GOP to oppose the bills. "First, both proposals make sweeping changes and cuts in the Medicaid program. Expert projections show that more than $1 trillion would be taken out of the Medicaid program between the years 2020 and 2036," she said in September. "This would have a devastating impact to a program that has been on the books for 50 years and provides health care to our most vulnerable citizens, including disabled children and low-income seniors." Collins has also cited the impact on Maine's rural hospitals, which are heavily dependent on Medicaid reimbursement payments. Architects of the federal health care law sought to lower the number of people without health insurance by requiring most Americans to have coverage. The law also lets states expand access to Medicaid, a federal program run by the states and funded with a mix of state and federal money. In 2013, Maine's legislature voted to expand the state's program, and Republican Gov. Paul LePage vetoed the bill. It was the first of a half dozen vetoes. About 9 percent of Maine residents lacked insurance in 2016, comparable to 8.6 percent in the 31 states and the District of Columbia that expanded Medicaid. That could be because the state had expanded its program in 2002 and 2003. In 2012, there were 345,000 Mainers receiving Medicaid. There were 268,000 through June of this year, according the Department of Health and Human Services. The state spends $2.6 billion on the program, with two-thirds of that coming from the feds. Meanwhile, roughly 70,000 Mainers have fallen into what's known as the ACA coverage gap. The gap occurs in the 19 states that did not expand Medicaid. The ACA originally conceived Medicaid expansion as a bridge between low-income adults already eligible for Medicaid coverage and those who could qualify for subsidies to purchase their own individual plans. 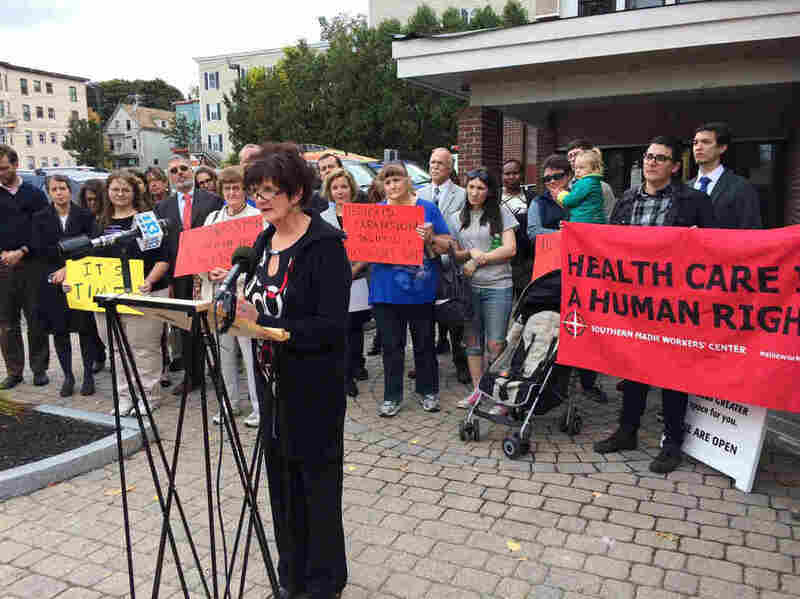 But without expansion, thousands of Mainers neither qualify for subsidies nor Medicaid. Most of the 70,000 people who would gain coverage if Question 2 passes earn up to 138 percent of the federal poverty level — about $16,000 a year for an individual and $34,000 for a family of four. Conservative and progressive activists have engaged in a long, pitched fight over Medicaid expansion. The arguments for and against expansion haven't changed much, and neither have the methods of persuasion. Conservatives repeatedly note that Maine was an early expander of Medicaid in 2002-2003. They claim that the state's uninsured rate was unaffected by increasing eligibility and that the program became a budget buster, creating deficits when state revenues declined during the economic downturn. Progressives counter that early expansion helped keep Maine's uninsured rate steady while other states saw a surge. Additionally, they argue that the higher federal reimbursement rate offered through the ACA protects the state. If expansion passes, the federal government will initially cover 94 percent of the cost. That ratchets down to 90 percent by 2020 and stays at that level, as long as Congress doesn't cut reimbursements. But Brent Littlefield with the anti-expansion Welfare to Work PAC says there's still a cost to Maine taxpayers. "The current plan would have state taxpayers paying between $50 million to $100 million per year," he says. The expansion debate has been marked by its heated rhetoric. Opponents have repeatedly called would-be recipients "able bodied," while calling the proposal "welfare expansion" — descriptions designed to tap sharply divided public perceptions of people receiving public assistance. Proponents, meanwhile, have been stressing the human impact, focusing on personal stories of those who would benefit from the program. Question 2 has been billed by some as a final resolution, but it could also be a litmus test for public sentiment about the Affordable Care Act. GOP repeal efforts have not polled well. While the ACA has not been a centerpiece of the proponents' arguments for expansion, an affirmative expansion vote on Nov. 7 could be spun as a tacit public endorsement for the health care law, because Medicaid is such a key component. Locally, the political stakes are high. LePage has been a leading critic of expansion, and he's taking an active role in opposing Question 2. Defeating Question 2 could validate the governor's stance. Conversely, an affirmative vote could deal a blow to the governor's full-court press against the law. But a victory for supporters of Question 2 could be fleeting. The state legislature changed, delayed or attempted to repeal all four of the ballot initiatives that voters approved last year. Steve Mistler is chief political correspondent for Maine Public Radio.